This week started out with my youngest son breaking his thumb, then Symon coming down with strep throat. Life was rather busy and chaotic, but then suddenly our 'dramas' paled in comparison with the horrific circumstances that many are experiencing in Christchurch after the latest earthquake. I think most of us in New Zealand (and many overseas) have been in a state of shock as we sit and watch the news. 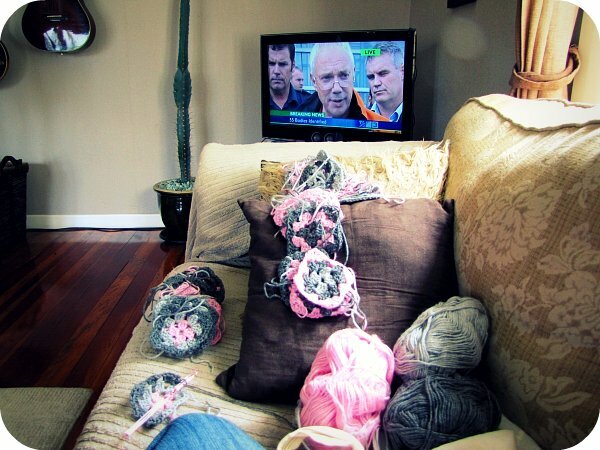 Strangely, (and despite having many more urgent things to do) I have found myself often sitting on the couch, staring blankly at the live coverage of the quake on the news and crocheting (in between tending to my dear man-sick males of course). Seriously, crocheting is soooo therapeutic. We have cried as sad news has been reported, clapped with joy at the footage of live people being pulled from the rubble, and prayed earnestly for these precious people in Christchurch. Thankfully there are many ways that we can help (see here and Gail is doing something awesome here) - it's the least we can do. Tomorrow, I am looking forward to my Things I'm Loving post, because seriously... despite the devastation and sorrow, there are many things that I am thankful for. Hoping you will join in too. Joining in here with my Creative Space. I agree crocheting is VERY therapeutic. Sad, how little coverage is on about it here in Oregon. I am glad I follow your blog or I would have never known... we'll be praying. 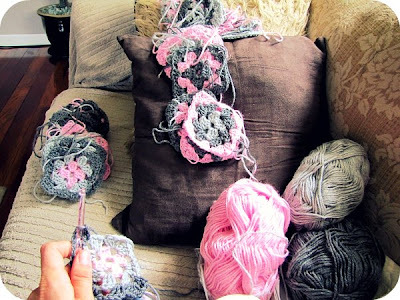 BTW: love those granny squares. I just posted some of my new ones. blessings as the family recovers..
Hi Kristy, thanks for visiting my blog, lovely to meet you! I've found you at a very sad time for New Zealand and of course the people of Christchurch are very much in our thoughts. We have already seen enough devestation from Mother Earth this year. My thoughts and prayers are with all involved with this latest disaster in New Zealand. I agree crocheting is very therapeutic and cheaper than seeing a therapist lol! Love the colour combo you're using. Oh goodness I can't imagine how scary it must be at the moment for everyone in NZ. My thoughts are with you all. Love the crocheting you're doing, keep going, hope your kiddies feel better soon. Your crochet looks great and I hope your sickies make a full recovery. Crochet is very relaxing!, and i have come to love it even more, because after the shake we were without power for a day or so, and I couldnt sew! Yes it is a bit hard to take watching people's lives unravel, we have seen plenty here in the last 2 months with the floods and fires. My brother and his wife live on the Nth Island but were anxiously waiting news of family in CC. All safe though, thank you God! It is so sad...those poor families who have lost loved ones. I do crochet so I will have to check out the link. Sounds like it is a good idea. In Australia we have been following all that has been happening in NZ and grieving alongside you all, Such a shock! 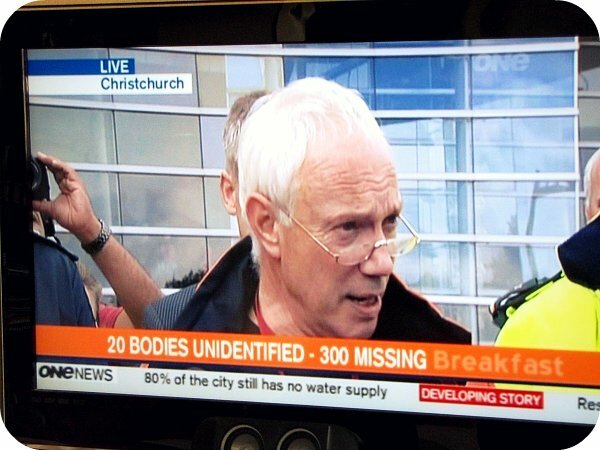 The coverage has been non stop on the TV here on most of the stations and we ache for Christchurch and it's region so much. Wow... love the grey/pink colour scheme..just gorgeous!! I can't believe all the years of free therapy I've missed out on. LIke you I too have been watching the reports with hook and yarn in hand. All so tragic and more sadness to come I fear. I do love your squares. xoxoxoxoxoxoxoxoxoxoxoxoxoxoxoxoxoxox your granny's look lovely. xoxoxoxoxoxoxoxoxoxoxoxoxoxoxoxoxoxoxo to all. so SAD! :( I'm finding I too can not watch as im an emotional person and hearing all the devastation It makes me cry.especially when you hear of lives lost.My heart and prayers go out to everyone.so much devastation this year in such a short amount of time. prayers to you, friend. our hope is in Him. When I heard about the earthquake in Christchurch I immediately thought about you and was praying for you all!! It is devastating and we will continue to pray! !